and daily sales for the first 12 days of Christmas! 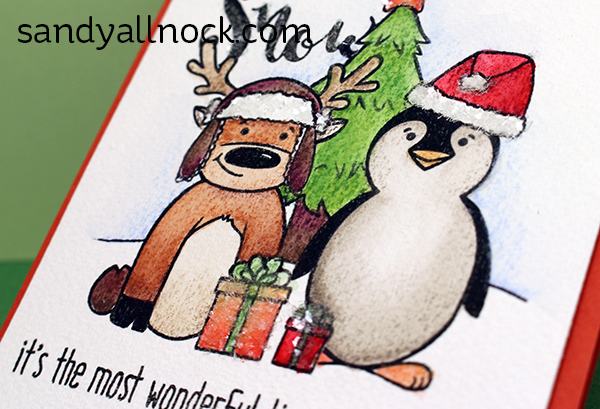 I’m excited to be part of Honey Bee’s “12 Designers of Christmas” series! Honey Bee has 1 spotlight designer each day for the first 12 days of December. The set each one used will be a featured sale item on the day that you are blogging. So today only – Flakey Friends and Flakey Sentiments are 20% off! This stamp sets they picked for me, called More Flakey Friends and Flakey Sentiments, has some cute images in it – and of course the fun “paper doll” pieces I love to add to my cards! I used a MISTI to get the setup together after planning it using masks. then colored it with Museum Aquarelle pencils. Check out the video below or click HERE to see it in HD on YouTube. oh gosh, yes, I am terribly impatient. Sometimes I’ll tell myself that if I’m extra careful it won’t get ruined… NOT… another lesson learned. the ear flaps on the hat make me smile. This is so adorable and those Ice Chip Crystals are gorgeous! Glitter….I couldn’t belive my eyes. Yes, I am impatient waiting for drying and have messed up projects due to impatience. I hope you are enjoying this Christmas Season and are able to spend it with family and friends!! Love this card. Love the Ice Chips. Love the look of the watercolor pencils. Maybe I am the only one to notice,but, did you intend to NOT add water to the ears of the reindeer? Just curious…LOL!! 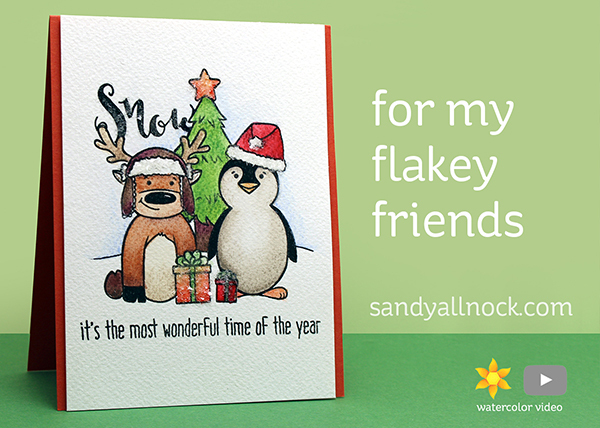 Such a fun and sweet card, Sandy. Makes me want to ink up a few never before used stamps and get out my Inktense pencils. Love this!! It is so cute! Of course I love all your cards. You make it look so easy!! Your card is very funny. These ice chips look really great. I also have got a big problem with waiting for something to dry (either watercolor, glue or anything which needs to dry). I did not find yet a good quality heat gun (cannot get the one from Hero Arts as I live in Europe ! ), so I even use my hair dryer to speed up things, specially watercolor ! I love this stamp set & I really want to try out that glitter you used. Going over to Honey Bee to get mine!